No one could have predicted the gigantic success of Once. The folksy musical, which began life as a 2007 indie film, is a simple story about a man and a woman, their joint love of music and their complicated relationships with the loved ones in their lives. There are no jaw dropping dance routines, no show stopping eleven o'clock numbers, no tricksy stage magic. And yet Once packs one hell of a punch. 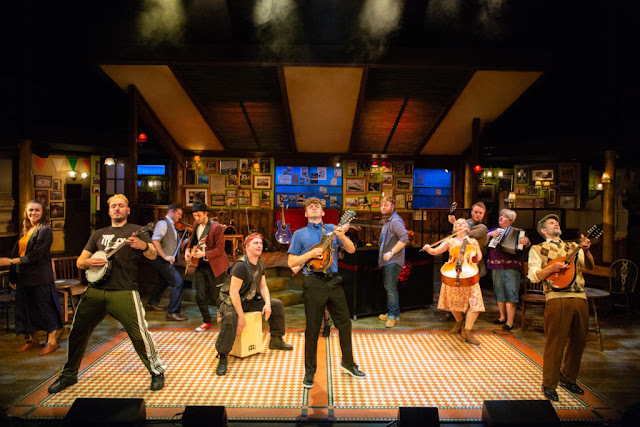 More that three years after the musical closed on the West End, Queen’s Theatre Hornchurch and the New Wolsey Ipswich present the Tony Award winning musical's UK regional premiere, directed by Peter Rowe. 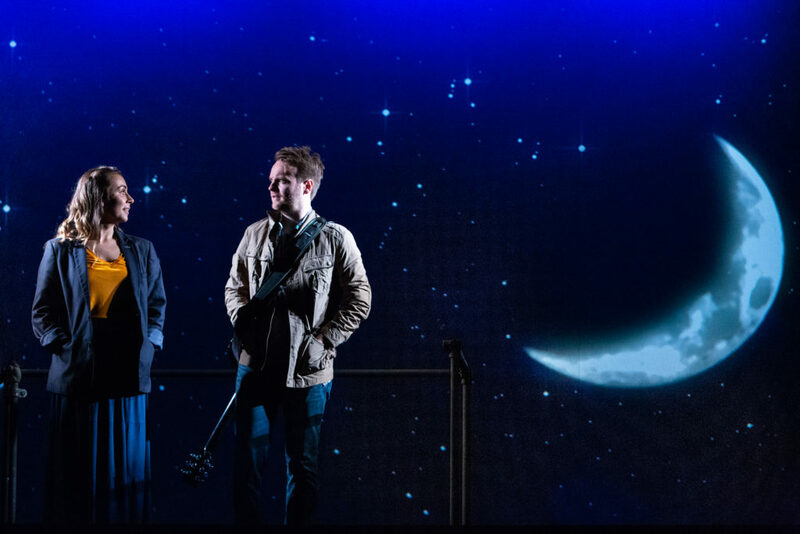 Rowe's direction draws out the tender and natural character growth in playwright Enda Walsh's book and gives the whole musical a sense of uncanny naturalism. The protagonist of Once is the enigmatically monikered 'Guy', a busker and hoover repair man pining for an ex who ran away to New York. He meets the frank and infectiously positive 'Girl', a Czech woman who just so happens to have a hoover in need of repair, and the two tentatively bond over the importance of music in their lives. In any other musical, the pair would embark on an epic love story central to the plot, and whilst Once doesn't shy away from the natural chemistry and budding romance of the two, from the moment they meet it is clear that they are destined follow a much less conventional path. The result is an astonishingly touching and overwhelmingly human portrait of love and heartbreak, with a hopeful yet fittingly ambiguous finale, which leaves audiences on a cautious high. The unforgettable music, by Glen Hansard and Markéta Irglová, encapsulates every emotion, teasing out pain and despair in every song, alongside the contrasting feeling of soaring joy and possibility. The swelling, longing Falling Slowly is, of course, a standout number in a sea of goosebump inducing songs. Additionally the entire musical is underscored extremely evocatively, allowing the production to maintain its magical atmosphere throughout. The cast of actor musicians directed by MD Ben Goddard must certainly be commended for their spirited playing. 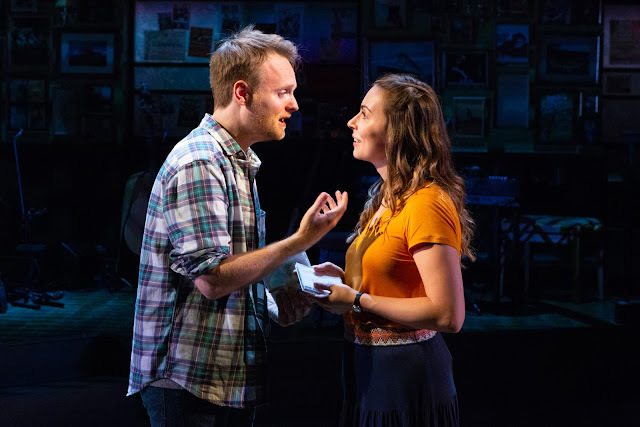 Perhaps most vital to the success of Once is the effectiveness of the performances given the two main character, and Daniel Healy and Emma Lucia are completely charming as 'Guy' and 'Girl', the heart and lungs of the piece. Of course the music of Once drives the action a lot of the time, but the silent moments matter too, and the quiet intensity of both actors' performances is utterly captivating. Having understudied the role in the West End production, it's not surprising that Healy masters the complex nature of his character, a man who seems utterly crushed, who is just going through the motions until he learns how to fall in love with life again. His voice perfectly suits the show's music; balmy yet with a distinctive edge, and he shines in his introductory number Leave, and makes an even bigger impression in Gold, the first act's closing number, which is unashamedly syrupy and poetic, and a complete tearjerker. Lucia is similarly magnetic, playing 'Girl' with a combination of extreme earnestness and unquashable zeal. Her rendition of the song If You Want Me is almost otherworldly, combining outstanding vocals with mesmerising movement by director Peter Rowe. The character is an extremely layered one, and Lucia gives an increasingly touching performance as the layers are slowly peeled back. Once is a musical which feels really special, and this new production directed by Peter Rowe is truly golden.